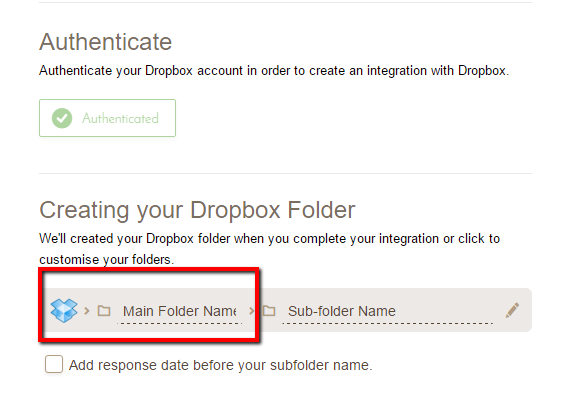 How do you set up responses to go to a specific folder within Dropbox? How do you set up responses to go to a specific folder within Dropbox? I had this set up for previous forms but I can't see how to do this in this new interface and the old forms that used to work no longer do so since I tried to see how they were set up! The first folder is the is the Main folder in which all the data will be placed. If you already have a folder created in which you wish to use. You can enter the name here. The second is a sub-folder where each submission will be placed. Each submission will be placed in a sub-folder. PS. I would like to inform you, at the moment we seem to have an issue with the integration. Our team already has a ticket open and are currently working on the issue.